Some expressions are popular with every generation. You’ve probably heard some of the ones on the left. 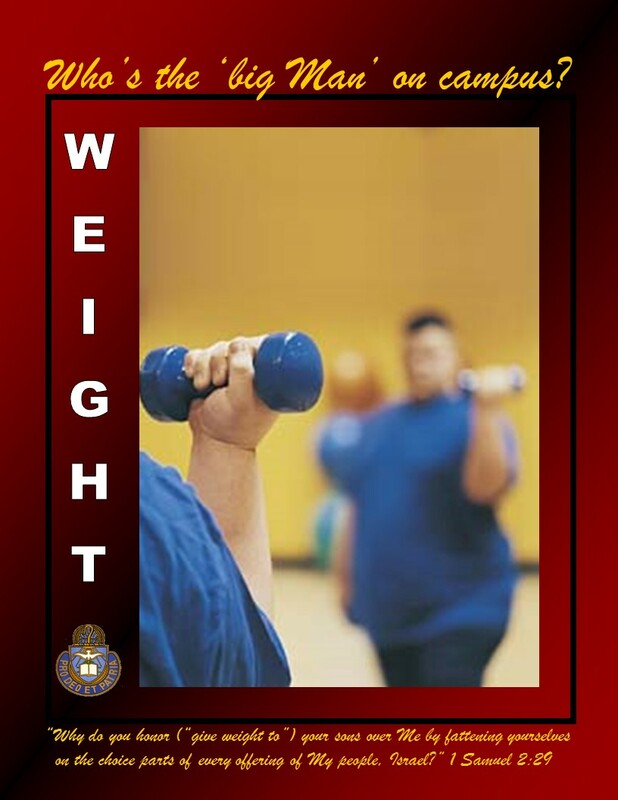 Images of “weight” usually communicate significance or power. The person or thing in question may not be physically heavy, but the person using the expression believes it be a “big‟ deal. Would it surprise you to hear that this imagery isn’t original to Americans or even the 20th century? When Old Testament authors wrote of God’s glory, they used the Hebrew word כּבד (kavohd) which literally means “weight”. So it’s no probably no coincidence that they also used the Hebrew word “shav” is usually translated “meaningless” or “vanity” in Ecclesiastes to express Man’s hopelessness in a world “under the sun” (without God). “Shav” means the exact opposite: emptiness. So what? It’s about where we search for significance. Are we proud that we’re “solid‟? Or are we fearful to “step on the scales‟? If so, we are looking inward and not upward. Faith in Jesus focuses upward to discover the significance & power of His weight so we can rejoice and be free. Inward searches lead us to be proud and “full‟ of self until we have no room for others or fearful until we’re so focused on self as light-weights that we never try anything difficult. Either way, everyone loses. In December of 1997, I was a Sergeant on a cold, wet field exercise in upstate New York when some news came over my 1SG‟s radio. “Congratulations, LT!” I couldn’t believe it! Months earlier, I’d finally finished a long list of requirements for a direct commission as a Chaplain and I was just waiting on the results. It had been a three-year ordeal, but now I was a “big‟ man. My CO allowed me to drive back to my office where Lauren had decorated my door with a big poster and colorful balloons. The actual date of commission was still a couple of weeks away, but that didn’t matter – I thought my world was glorious! For days, I left the stuff on my door to bask in my “weight‟. Only after I thought everyone had seen my good news did I reluctantly take down my shrine and carefully set everything on top of my filing cabinet. For days, I searched for his stuff to no avail. After about a week, I employed an old feel-better-about-myself technique: “Clean the office. At least I’ll look professional!” – even if my job performance begged to differ. I swept the floor, arranged my desk, cleared out my in-box, and finally threw out the glorious poster and balloons on top of my cabinet. Guess what I found underneath. You got it – the Soldier’s paperwork. My glory had overshadowed his needs. The “weight‟ that I had hoped would empower me with significance to serve had actually turned out to be a bunch of hot air that hurt a Soldier. This is why Scripture says to give God the “weight‟. We just don’t have the spiritual shoulders or heart to carry the glory! When we try, we eventually disappoint others and ourselves. The story of Eli and his sons in 1 Samuel 2 makes paints a vivid picture of “weight‟ and glory. Hophni and Phinehas were taking the best of Israel’s offerings for themselves, and God confronted their father for glorifying themselves rather than Him. Read His specific rebuke in 1 Samuel 2:29. But Eli’s sons would not listen to his rebuke. Why? Read what happened later, in 1 Samuel 4:11-18. When the ark, a visible symbol of God’s glory (weight) was captured, Hophni and Phinehas were killed and Eli literally died under his own “weight‟. It seems that he, too, had been feeding his ego! Paul tells us “For bodily exercise profiteth little: but godliness is profitable unto all things, having promise of the life that now is, and of that which is to come.” (1Timothy 4:8). We must resist the urge to “fatten‟ ourselves and, instead, reflect on God’s weight that is truly glorious. After all, what’s more significant and powerful – having a body that can run 2 miles in 13 minutes or having a spirit that is inspired by His love, power, and wisdom to commit to the Body of Christ? What will benefit our families more – having arms that can throw our children in the air or a having heart that Jesus has forgiven and changed so we no longer scream at our children when they scream at us? The answer is clear, isn’t it? Watch creation, especially your body, for images of weight. Accept these as spiritual messages to you.